In 2015, the Air-Conditioning, Heating, and Refrigeration Institute (AHRI) introduced a performance rating for dedicated outside air systems. All references in this document refer to the AHRI Standard 920 (I-P) document. This was a very timely announcement as it corresponded with the increasing demands for measurable energy efficiency solutions and methods to reduce global warming. At the same time the ASHRAE SPC 90.1- 2016 committee was updating their standard and wished to include minimum rating values for this type of product. The AHRI 920 and 921 are sister documents in that they both provide a methodology to calculate the integrated seasonal values. The difference is in that AHRI 920 is the inch-pound standard and AHRI 921 is the metric standard. It should be noted that due to differences in the rating points being rounded to the nearest whole number, the actual energy efficiency numbers cannot be converted between each standard. The latest versions of ASHRAE 90.1-2016 energy standard is emphasizing the importance of off-peak conditions. Keep in mind that design conditions occur less than 1% of the time, so the system functions for most of its operating life at part loads. Like the chiller product's integrated part load values (IPLV) and air-conditioners IEER and SEER, the new DOAS standard has introduced its own version of integrated values. DX-Dedicated Outdoor Air Systems (DX-DOAS) condition outdoor ventilation air independently from the building HVAC system. This approach to handling ventilation air results in superior humidity control by limiting the primary source of humidity in most buildings – ambient humidity carried in by the ventilation air – directly at its source before it enters the building. The decoupling of the ventilation air's requirements from the building's internal sensible requirements allows both systems to be designed for maximum energy efficiency. The energy savings can be obtained by running the separate, sensible cooling only, interior cooling system less often or at a higher evaporating temperature, thus improving the overall energy efficiency. Further energy savings may be realized by providing only the amount of ventilation air necessary and/or by using energy recovery from the building exhaust air to pre-condition the ventilation air. If exhaust air can be brought back to the DOAS unit, then pre-conditioning the outside aire with an energy recovery wheel or plate heat exchanger will improve the energy efficiency of the system. The dehumidification only system utilizes a cooling tower water loop for its condensing water source. The temperature of the fluid usually varies from 55°F to 90°F. The dehumidification only system utilizes a chilled water loop for its condensing water source. The temperature of the fluid usually varies from 40°F to 60°F. A heat pump that uses fluid circulated through a subsurface piping loop as a heat source/heat sink. The temperature of the fluid is related to climate and operating history conditions and usually varies from 25°F to 100°F. A heat pump that uses water pumped from a well, lake or stream as a heat source/heat sink. The temperature of the water is related to climate conditions and usually ranges from 45°F to 75°F for deep wells. A heat pump that uses fluid circulated in a common piping loop as a heat source/heat sink. The temperature of the piping loop fluid is usually mechanically controlled within a moderate temperature range of 61°F to 89°F. This rating standard has been developed to provide design engineers with a relative guide to quantify the energy a DX-DOAS system will consume while dehumidifying and reheating ventilation air to a neutral 70°F condition at several different outside air conditions. Unlike air conditioning systems, the dehumidification process requires the system to condition the air to the design dewpoint (this is established at a 55°F dewpoint in the case of this standard) in order to remove the moisture before it enters the space. The system then must use 75% to 90% site recovered energy, no new energy, to reheat to the neutral condition as stated in ASHRAE 90.1. Use of the hot gas reheat coil is a common solution utilized to achieve the site recovered requirement. The ambient conditions that the unit must be designed for vary throughout the year, so the AHRI standard utilizes four different dehumidification entering air conditions or rating points as a method to demonstrate the moisture removal efficiency (MRE) at part load conditions. This is expressed as the amount of moisture removed per kilowatt-hour of energy used. Refer to Figure 1 for a psychrometric plot of the calculation of the total cooling required to meet the 55°F dewpoint and the amount of moisture that must be removed. In order to meet this demand, DOAS units must have a very low sensible heat ratio and have unique refrigeration circuits to handle this wide range of entering air conditions. A detail psychrometric review can be found in Desert Aire's Technical Bulletin #3, Dehumidification and the Psychrometric Chart. If the system is a heat pump, the standard also defines two rating points for winter heating. The heating performance is stated as coefficient of performance (COP), which is units of watt output divided by the watt input. Refer to Tables 1 and 2 for the input values based on the configuration selected for the specific application. To model real world conditions, the standard also has established an external static pressure for various supply air volumes and has added a pumping penalty to account for the energy consumption adder of water-cooled systems. The AHRI committee used a composite bin hour data set of multiple cities to provide a weighted value moisture removal efficiency and coefficient of performance value. This weighted value puts emphasis on the part load values in calculating the integrated seasonal ratings. Table 3 lists the weighting percentage values. The integrated seasonal values are defined as a weighted average of the individual rating point values and are expressed in pounds of moisture per kilowatt (MRE) in the dehumidification mode and in watts input per watts output (COP) in the winter heating mode if the system is a heat pump. It is important to note that the rating standard adds the requirement that if the DOAS unit cannot bring the leaving air temperature back to 70°F with recovered energy, that a supplementary heat penalty be incorporated based on the use of an electric heater. An alternative method would be to utilize a larger compressor that provides excess capacity to reheat the air to 70°F at a higher input power. In the dehumidification mode some systems need to increase their hot gas bypass capacity at the C and D conditions. These systems use the recovered energy to prevent the evaporator coil from freezing instead of directing the energy to the hot gas reheat coil, therefore not having enough energy to meet the 70°F requirement. This standard thus allows an appropriate comparison by allowing those systems to use more energy to reach the required leaving air temperature. Likewise, in the winter heat pump mode some systems are unable to heat the winter outdoor air to the required 70°F minimum value listed in the standard. The penalty adds in an electric heater to make up the difference. Such a system will have a lower COP, but be in compliance of the 70°F leaving air temperature specification. For systems that are not equipped with a heat-pump mode of operation, the type and efficiency of supplementary heat sources will be published with manufacturers data. These heat source types and efficiency should be reviewed carefully when making comparisons between different types or manufacturers equipment. The AHRI 920 standard provides a method to compare a specific manufacturer’s design to the minimum standard as published by the AHRAE 90.1-2016. This allows the design engineer the ability to evaluate the different configurations of manufacturers of DX-DOAS equipment in order to meet the energy goals of the building owner. The ISMRE conversion value for the average moisture removal of 20 lb/hr per 1,000 cfm was arrived at by calculating the individual moisture removed for points A to D for 1,000 cfm of outside air to a 55F dew point. These individual values then were compiled into a single value using the weighted values from the ISMRE calculation. So the derived value is 0.020 lb/hr/cfm. 1) Using the weighted average moisture removed from the integrated values, calculate the average capacity (see sidebar for details of the constant derivation). 2) Using the average moisture capacity, convert the efficiency to average power. 3) Multiply the average power use by the local utility rate and the bin hours about the design dew point. For example, a 5,000 cfm DOAS unit would remove a weighted moisture content of roughly 100 lb/hr. A 4.0 ISMRE system would have an average power of 25 kW during dehumidification. Using a bin hour total in the dehumidification mode of 4,800 hours and a utility rate of $0.10/kWh would provide an annual cost of $12,000. The selected unit at an ISMRE value of 8.0 would cost only $6,000, thus the selected unit would save the owner $6,000 per year of operation. Although there are variances in loads for any particular area and the weightings of the 920 standard are a composite of many different area of the US, experience has shown that the formula above gives a very good estimate of the energy costs. Results can be used to make appropriate decisions regarding the initial system cost verses continued energy use. 1) Using the weighted average heating requirement removed from the integrated values, calculate the average heating capacity (see sidebar for details of the constant derivation). 3) Multiply the average power use by the local utility rate and the bin hours above the design dew point. For example a 5,000 cfm OAS heat pump unit would require a weighted heating requirement of 62.5 kW (213 MBH). A 2.0 ISMRE system would have an average power of 31.25 kW during heating. Using a bin hour total in the heating mode of 3,950 hours and a utility rate of $0.10/kWh would provide an annual cost of $12,344. The selected unit at an ISMRE value of 4.0 would cost only $6,172, thus the selected unit would save the owner $6,172 per year of operation. DOAS units operate in many different climates and can be selected with a wide variety of designs and condensing options. This makes it difficult to compare the energy efficiency of treating outside air from one design to another or from one manufacturer to another manufacturer. However, this is extremely important as the process of treating outside air to improve indoor air quality is energy intensive. The AHRI 920 standard is a tool that can be used to compare the energy efficiency of different manufacturers' offerings to optimize the energy consumption for the end user. In addition, ASHRAE has established minimum values for DOAS units. This provides the designer the base level to establish the specification criteria. By using the calculations in this application note, the design engineer can also compare the payback time required to specify the higher energy efficient designs. 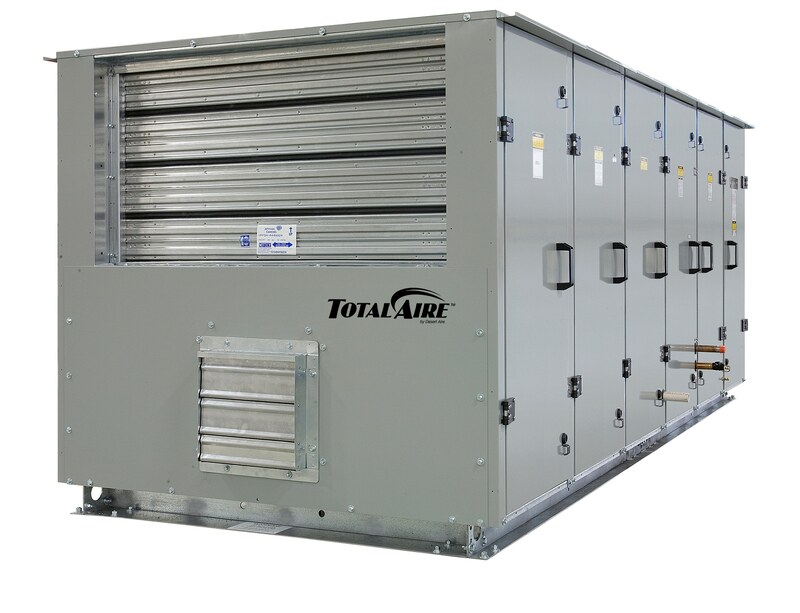 TotalAire™ Series DOAS systems offer our widest range of performance options including energy recovery wheels and secondary condensers for integration with any building type or location.